It is a long standing tradition, that in Texas, bigger is always better! At 7" x 70 ring gauge, every cigar connoisseur who lights up an Alec Bradley Texas Lancero will discover this belief is still true! Each of these hand-rolled premium cigars is constructed around a 4 year old three-nation filler blend of Costa Rican, Nicaraguan and Honduran tobaccos, with a Nicaraguan wrapper holding it all perfectly together. Alec Bradley Texas Lancero premium cigars are medium-bodied, offering a flavor profile that includes notes of nuts, leather, and citrus. Another rich flavored and satisfying smoking experience created by one of the best premium cigar brands on the market today, Alec Bradley! Smokers Discounts has made it easy and affordable to buy hand-rolled premium cigars online. 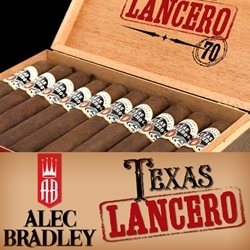 We can ship Alec Bradley Texas Lancero premium cigars right to your front doorstep. A variety of sizes and flavors are listed below at our discount online cigar store. Each of these styles are in stock and available. Call us for more details!